Vobis Pilot Scale Falling Film Evaporators enable clients to separate quantities from 50 to several thousand kilograms per hour of solvent from product and generate data necessary to develop a process which is scaleable to production (ie. 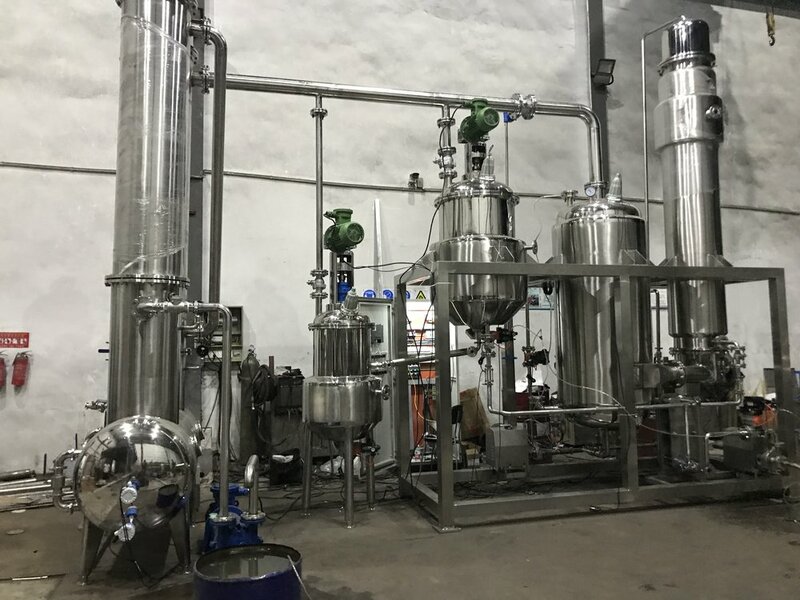 we implement these systems in production scale Industrial Hemp processing for removal of ethanol from extract oil complete with PLC controls). Our Falling Film Evaporators work via the following general process: raw material is fed through our proprietary optimized distribution system to the top of the heating tubes, and is then evenly distributed on the inside of the tubes’ walls. A thin, turbulent flow of the liquid film spirals down the inside of the tubes, coating the entire surface for excellent heat transfer. The vapor and liquid are separated in a separate vessel where entrainment is minimized. Falling Film Evaporator systems from Vobis are compatible with heat-sensitive products with relatively low to medium viscosities; they have a short residence time in the tubes, and typically evaporate under vacuum conditions to lower the boiling point in order to protect heat sensitive materials. The short residence time minimizes heat exposure, and operation under vacuum allows for lower temperature evaporation, ideal for heat sensitive liquids such as those found in natural products post extraction solvent removal ie. for hemp. High evaporation loads can also be readily accommodated; when necessary, for fully wetting the complete length of the tubes' wall surfaces, recycling of liquid can be implemented. Efficient operation of our falling film evaporators, which are often implemented for temperature-sensitive products, is achieved through several design features. Optimized liquid feed distribution to our falling film tubes helps to create high heat transfer coefficients. Low pressure drop minimizes fouling. Automated PLC process controls for operational variables including temperature, vacuum, and feed rate, insure accurate control and reproducible results. The minimum material inventory requirement provides for flexible operation, quick start-up, and easy changeover among different products. Falling film evaporators are utilized for liquids with low viscosity without complication. Our falling film evaporators are widely utilized in most industries including: dairy, food, nutraceutical, pharmaceutical, chemical and petrochemical fields. As an example, our falling film systems are used for heat sensitive natural products such as plant extracts for the solvent recovery systems after extractions such as in our solvent recovery systems in the hemp industry where we provide falling film as well as pot still evaporation systems to recover 50Kg/h, 100Kg/h, 200Kg/h, 400Kg/h, 800Kg/h, 1000Kg/h, 2000Kg/h, 5000Kg/h or more of ethanol from hemp extract or as needed to match the client process of solvent recovery. Results obtained through the use of a Vobis smaller throughput falling film evaporators can be scaled directly to enable us to design and manufacture large, energy-efficient falling film production systems – including the implementation of multiple effect systems with thermal vapor compression or mechanical vapor compression. Please see our production system Vobis LLC website in order to access more specialized information regarding full scale production evaporators.